Herman was born at Cologne around 1150. Already from his earliest childhood he manifested a tender devotion to the Blessed Virgin. The Vita, written by his prior, recounts that he went daily to pray in the church of St. Mary of the Capitol in Cologne. One day he offered an apple before the statue of the Virgin and Child. 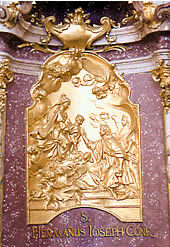 Mary bent down so that the Christ Child could reach it. Herman was about twelve years old when he entered the Norbertine abbey of Steinfeld in the Eifel (located in the diocese of Cologne at the time, currently in the diocese of Aachen). He was sent to Mariëngaarde in Friesland for studies. Even as a young man he liked to practice strict penance. After his return to Steinfeld and his priestly ordination, he was appointed to serve in the sacristy and refectory. In these manual labors he developed an extraordinary spiritual life and received numerous mystical gifts. He received the surname “Joseph” on account of a vision in which the Blessed Virgin accepted him as her betrothed. His childlike piety and frequent ecstasies caused misunderstanding on the part of the confreres, some of whom regarded him as a simpleton. Herman Joseph was a model religious in the spirit of St. Augustine. He was humble and poor, and showed himself patient and friendly to everyone – especially to those who understood him the least. He was a model of obedience to his superiors and was always ready to serve his confreres. Herman Joseph wrote several hymns in honor of the Blessed Mother, St. Ursula and her Companions, and a commentary on the “Song of Songs” (which has since been lost) – all in a style full of feeling, which demonstrated this deeply religious man’s genuine poetic talent. He is one of the first who expressly honored the Sacred Heart of Jesus in a genuine mystical way based totally on the Holy Scripture. He was also acclaimed for his dexterity in making and repairing clocks. Herman Joseph was appointed spiritual director to the Cistercian nuns with whom he had regular contact. The nuns so prized his spiritual guidance that on one occasion they pretended that they needed their clock to be fixed – just so they could bring him to their convent again. During the final Lent of his life he was at the monastery of the Cistercian nuns in Hoven, a few miles from Steinfeld, where he became gravely ill and died on the Thursday after Easter, April 4, 1241. His body was returned to Steinfeld in a solemn procession on the Tuesday after Pentecost, several weeks after his death. It now rests in a raised tomb in the middle of the church. His veneration began immediately after his death with numerous miracles reported at his tomb. His prior wrote his Vita and devotion to Herman Joseph continued to grow uninterruptedly. On January 22/March 8, 1728, Pope Benedict XIII permitted his veneration and consecrated an altar in his honor in the “Collegio San Norberto” at Rome. His cult, which was alive for centuries, was formally recognized when Pope Pius XII gave Herman Joseph the title “Saint” on August 11, 1958. St. Herman-Joseph is venerated in the Rhine region and in the Norbertine Order as Patron of children and of students. O God, who promised Your kingdom to little children, grant that following in the path of St. Herman Joseph we may hasten cheerfully and humbly to heavenly joy. We ask this through our Lord Jesus Christ, Your Son, Who lives and reigns with You in the unity of the Holy Spirit, one God forever and ever. Amen.